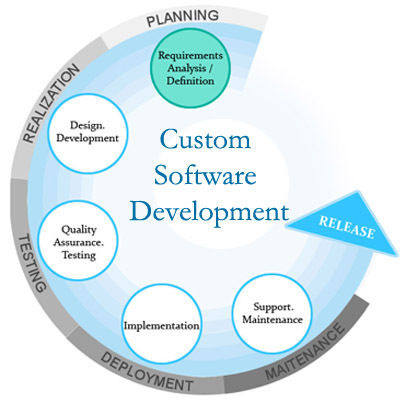 We are a premier custom application development services company provide that can satisfy business requirements such as design, develop, test and integrate software across multiple platforms. Customised software applications development have become a more than just a norm in today's business world; they have become a necessity. With advanced software to help you sort through and manage vast amounts of data, assess the market, and make calculated business decisions, an organization can skyrocket its productivity. With the right application that caters to all your business needs, a company can save resources both in terms of money and time. Custom Apps Development Services: Custom mobile application development services understands your business requirements thoroughly and builds custom software applications that best compliments your business. This ensures a longer operation life of the application, with minimum maintenance and support. Application Upgrade & Maintenance Services: Our application maintenance services maximize your existing IT applications through offshore-ability analysis, maintainability analysis, maintenance, and enhancement. Application Management Services: Our Application Management practice offers a wide range of support services for various platforms and technologies. Application Modernization & Customization: Our application modernization services help modernize legacy systems to enhance flexibility, mitigate risk, minimize disruption, and lower costs. E-commerce Applications Development: E-commerce apps development solutions that connect buyers and sellers through B2C and B2B online business channels, provide integration to back-end applications, and provide integration to payment solutions. Enterprise application integration (EAI): Enterprise application integration (EAI) practice enables you to seamlessly operate business processes by integrating the underlying applications, facilitating real-time information sharing. Application Portfolio Management: Application portfolio management services help you decide on a portfolio strategy. And, then assess and govern the portfolio on an ongoing basis. Packaged Application Services: We help you automate your value chain through off-the-shelf application packages. We enable you to realize value through configurable package-centric solutions. Performance Engineering and Enhancement Apps: Our performance engineering and enhancement services further the performance and scalability of applications across the technology stack and application life cycle. Architecture Assessment/Evaluation: Offers a complete architectural analysis and assessment / evalution of your IT application - focusing on quality of service (QOS) parameters such as scalability, performance, interoperability, and usability. Microsoft Application Development: End-to-end services for clients who require a tightly-aligned applications infrastructure, supported by various Microsoft development platform and other enterprise-based technologies locally or globally. Learning Apps Development: A range of services to help design, build and deliver high quality application training modules in a variety of formats including classroom and technology-based delivery.